Left Handed Callaway Big Bertha A Wedge. Left Handed. Head - 9, shaft - 9, grip - 9. Left Handed Callaway XR Cup. LEFT HANDED CALLAWAY GOLF DIABLO EDGE No.9 IRON ONLY. LENGTH: 93.5 cm. LEFT HANDED CALLAWAY DIABLO DRS 3 HYBRID 21 DEGREES FITTED WITH A STEEL UNISEX FLEX SHAFT. 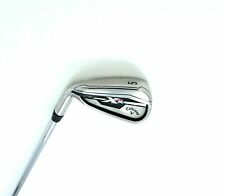 Callaway X Series 416 golf clubs. 5-sw (7 clubs) again rare for set! The club head is in good condition but please refer to photos for scratches and dints. The shaft is a Callaway X-series in regular flex which is in great condition The grip is Callaway branded and still has loads of life left in it. If you need anymore information or photos please message me and I will get back to you as soon as possible. All clubs are bubble wrapped and shipped in appropriate boxing. I use My Hermes to ship so to keep the costs down. Please no offers below asking price please. Left Handed Callaway XR Cup 360 5 Iron. Callaway Golf X Hot N14 5 iron in good overall used condition. Callaway Golf X Hot uniflex steel shaft, minor pitting as shown. Callaway Golf grip in good condition. All pictures are of the actual club for sale. MODEL : MD3 W GRIND. CALLAWAY MAC DADDY MD 3 56/12 W GRIND WEDGE EX DEMO BUT FANTASTIC CONDITION. BOUNCE : 12 DEGREES. SHAFT : DYNAMIC GOLD WEDGE FLEX. Left Handed Callaway Tour X 56 13 Degree Sand Wedge. Left Handed Callaway X Hot 3 Iron. Apex Pro 16. Left Handed. Standard lie. Head - 9, shaft - 9, grip - 9. Callaway Diablo uniflex steel shaft. FITTED WITH A CALLAWAY REGULAR STEEL SHAFT. Good condition as seen.Will have the odd scuff/mark but nothing major. Left Handed Callaway Big Bertha Pitching Wedge. Left Handed Callaway Big Bertha Sand Wedge. LEFT HANDED CALLAWAY GOLF DIABLO EDGE No.4 IRON ONLY. LENGTH: 100.5 cm. Left Handed Callaway X Hot Pitching Wedge. 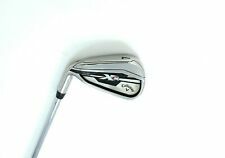 Callaway Golf X Hot N14 7 iron in good overall used condition. Callaway Golf X Hot uniflex steel shaft, minor pitting as shown. Callaway Golf grip in good condition. All pictures are of the actual club for sale. Left Handed Callaway Apex Forged CF16. Left Handed Callaway X-HOT 5 Iron. Left Handed Callaway X20. Pitching Wedge. Left Handed Callaway Big Bertha. Left handed Callaway RAZR X HL. Lincs Golf. Left Handed Callaway Big Bertha 9 Iron. MODEL : MD3 C-GRIND. CALLAWAY MAC DADDY MD 3 58/08 C-GRIND WEDGE BLACK SATIN EX DEMO BUT FANTASTIC CONDITION. BOUNCE : 08 DEGREES. SHAFT : DYNAMIC GOLD WEDGE FLEX. Callaway Big Bertha Uniflex Steel Shaft. 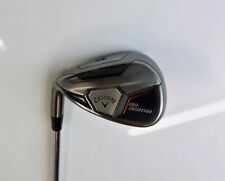 Callaway Big Bertha 08 I-Brid 5 Iron (Left Handed). Standard Lie Angle. Shaft - 8 out of 10. Showing light marking standard wear and tear only. Head - 8.5 out of 10. One only with the cover our Demo/Display club in LADIES LEFT HAND. This is the 2017 model of the Callaway XR Ladies Hybrid, The club is virtually as new and doesnt look like its ever hit a ball. Grab a BARGAIN. Left Handed Callaway Steelhead CF XR Cup 360. Lincs Golf. Pitching Wedge. Left handed Callaway RAZR X HL. Lincs Golf.